Sr. Lois Marie Metoraj's brave witness to life at Citizens for a Pro-life Society's demonstration at the Joyce Center on the campus of the University of Notre Dame, the day of the "Obama commencement," May 17, 2009. Felician Sister, Lois Marie Mitoraj and 14 members of Citizens for a Pro-Life Society were Arrested Protesting the Obama Commencement Speech at Notre Dame. Dr. Monica Migliorino Miller, Director of Citizens for a Pro-Life Society, was among those arrested. Arrests also included two Madonna University students--one of them only 18 years old! Two other college students also arrested. Monica Migliorino Miller arrested outside of the Joyce Center--attempting to show photo of aborted baby to Notre Dame graduates. 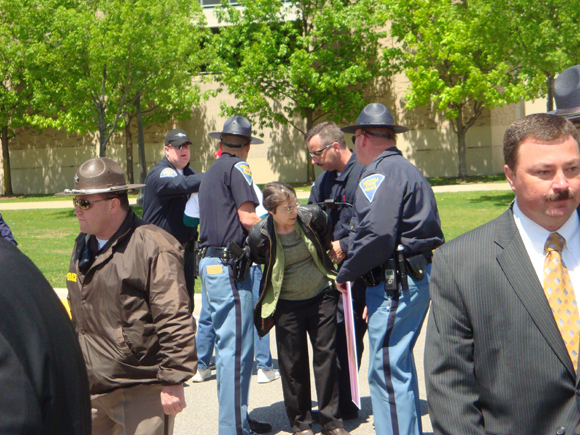 Sunday, May 17, 2009, fifteen members of Citizens for a Pro-Life Society were arrested when they entered the parking lot of the Joyce Center on the campus of the University of Notre Dame where Notre Dame commencement ceremonies were taking place. Twenty-five CPLS members actually entered the parking lot of the Joyce Center, carrying photographs of victims of abortion. 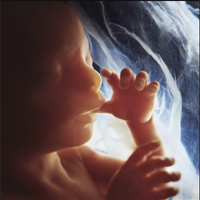 These were aborted babies who bodies were retrieved from trash dumpsters behind two Michigan abortion clinics in 2008. Members of the group were able to make their way through the parking lot and finally stood within 200 feet of Notre Dame students, dressed in their graduation robes, lined up outside of the Joyce Center to process into the commencement ceremony. As Air Force One flew low over the parking lot, carrying Obama to the commencement, CPLS members proceeded toward the ticket gates outside of the Joyce Center. The goal of the protesters was to stand as close as possible to the graduates filing into the Joyce Center and show them photos of the abortion victims--found at the bottom of dumpsters, babies killed and placed into the trash under a law that Obama supports. Led by Dr. Miller, fourteen of those carrying the photos followed her past the ticket gates. At that point they were apprehended by Indiana State Police and Notre Dame Police, handcuffed and taken into custody. They have all been charged with the misdemeanor charge of trespassing. Those arrested were: Sr. Lois Marie Metoraj, Monica Migliorino Miller, Ph.D., Dennis Haymaker(18 years old and Madonna student), Jean Chase (Madonna student) and her sister Tracy Chase (college student), Debra Anderson, Linda Schmidt, Grace Allasio, Mary Giroux (college student), Dr. Terese Ranchor-Beste, Vicki Reirson, Anne Mitzel, Joseph Tornichio, Joe O'Hara (78 years old) and Judy Parran. At least two graduates, one with tears in her eyes, left the parking lot after viewing the abortion photos, and were persuaded not attend the commencement. Hundreds of people entering the Joyce Center saw the photos of the abortion victims and CPLS members were able to engage several graduates and their families in conversation and debate as they walked across the parking lot to attend the commencement ceremony.